What is the first word that comes to mind when you hear “Rwanda”? Is it “genocide”? If my sampling of family and Columbia-educated friends are any indication, that is probably the most common answer. During the course of 100 days in 1994, about the time we watched O.J. Simpson take flight in his white Ford Bronco, nearly one million Tutsis (Rwanda’s minority population) were mur­dered at the hands of their friends, neighbors and co-workers. To be precise, 10,000 people were slaughtered every day for 100 days. A country was left, at the turn of the 21st century, with six million people whose lives were shattered into little pieces. How does a nation heal from that? I landed in Kigali National Airport in August 2010 with one goal: to teach rural Rwandan women basic business principles. Now, before you rush to categorize me (“Bono-loving, tree-hug­ging, do-gooder volunteer”), let me clarify. I had spent my first two years out of college working for McKinsey & Co. in New York City, consulting for huge for-profit corpora­tions. But when McKinsey offered me the opportunity to leave everything behind and volunteer for a nonprofit in Rwanda, one image immediately came to mind, and it was not of the genocide. It was of my “Prin­ciples of Economics” professor, Sunil Gulati, giving his last lecture of the course in the spring of my sophomore year with a slide­show of images from developing countries — a reminder of the real-world implications of my economic studies. I’m sure fellow Co­lumbia graduates will understand when I say it was a lecture I will never forget. With that image in mind, I did not hesitate to sign up to move to Rwanda for firsthand experi­ence of the issues I had only ever studied in Morningside Heights. My task was to launch a “principles of business” training program for 200 cooperative leaders, all of whom are genocide survivors and their families’ sole providers. Why a business training program for ru­ral Rwandan women? Rwanda often is touted as a sub-Saharan Africa success story. GDP grew at 7.5 percent last year, infant mortality has decreased by almost half during the last decade and primary school enrollment rates are at 97 percent. On the ground, though, where 93 percent of the population lacks access to electricity and where the GDP per capita is still only $500, the setbacks resulting from the genocide are overwhelming. Since 1994, the government of Paul Kagame has promoted coopera­tives, group enterprises largely operating in agriculture, to ad­vance rural economic progress and political stability. Many of the cooperative leaders, however, lack the basic business skills to run a microenterprise. My task was to launch a “principles of busi­ness” training program for 200 cooperative leaders, all of whom are genocide survivors and their families’ sole providers, to accel­erate the income-generating potential of their cooperatives and their 7,000 members. The value placed on such training became swiftly apparent when I met Renatha, a maverick smallholder (small plot of land) farmer with a baby strapped to her back. At our first lesson, one of the local instructors noticed that there was a woman in atten­dance who was not on our list. When asked what she was doing there, Renatha said that she had become determined to attend the course as soon as she had learned of it from her cooperative’s leaders. Unfortunately, our tight budget prevented us from covering the expenses of any additional participants, including trav­el vouchers to get to and from training each day. We apologized for the situation, but welcomed her to stay for that day’s lesson. The following day, Renatha returned. And again the next day. And the one after that. Through my translator, Diana, I asked Renatha how she was managing this. She stood up, gestured emphatically with her hands and spoke loudly in Kinyarwanda. Diana explained that Renatha had taken out a loan from friends to pay for her travel to the class. Renatha defiantly declared that she would continue to do so until we told her to stop. She knew from the first day how powerful the knowledge of running a business could be, and said she would do anything to access that knowledge in order to teach it to her family. I smiled, handed Renatha 2,000 Rwandan Francs (less than $4 U.S.) for travel and said “Ni ahejo,” see you tomorrow. During the next few months, I and the team of instructors I supervised taught and re-taught lessons on profit and loss, test­ed and re-tested the women’s understanding of marketing and visited the cooperatives to see how they were implementing the lessons from the classroom. 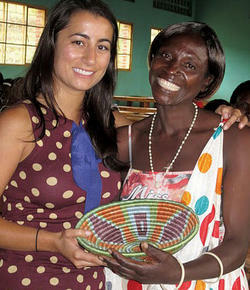 The president of a local women’s cooperative in the Muhanga district presents Neda Navab ’08 with a handmade basket as a token of thanks at the training program graduation ceremony. When we visited Renatha’s maize-growing cooperative in the rural district of Kayonza, the coopera­tive leaders beamed with pride as they told us about their contract negotiations with a potential agricultural broker. According to them, the buyer wanted to buy maize for 200 Rwandan Francs per kilogram. Women in the co­operative thought they could take advantage of the foreign buyer, and so they asked for 800 Francs — an unreasonable price. Then, the women who had attended the business training, including Re­natha, came in to broker the deal. They negotiated with the buyer based on their understanding of how to appropriately price the maize by calculating their costs. They knew to talk about costs and the market price. They negotiated a contract for 330 Francs per kilo­gram — a great feat. At the graduation ceremonies several months later, our women chanted self-written lyrics about the importance of cashbooks, their commitments to implement change in their cooperatives and their hopes for leading change in their communities. What is the first word that comes to my mind when I hear “Rwanda”? Neda Navab ’08 continued to pursue her passion for development, working on projects in Tanzania and South Africa this year. She is attending Harvard Business School to earn an M.B.A. with a focus in social entrepreneurship. She hopes to return to Rwanda in the near future.